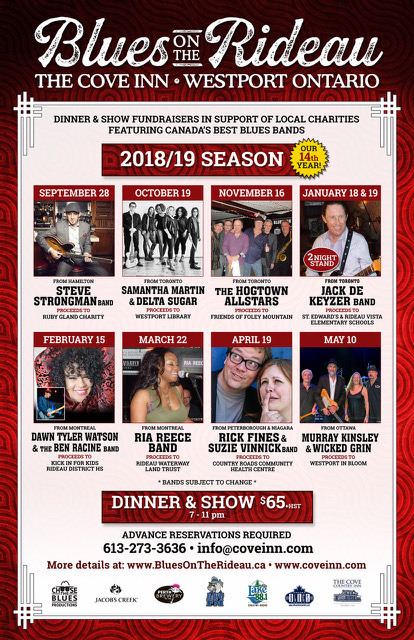 Choose The Blues Productions in co-operation with The Cove Inn is pleased to announce the return of the Blues On The Rideau Dinner & Show Fundraiser Series at The Cove Inn, Westport ON September 28th. The season is dedicated to the memory of Diane Leduc Doran – partner in BOTR along with James Doran – who passed away last November. BOTR @ The Cove is now recognized as one of the premier Blues Series in the country featuring some of Canada’s best Blues, Soul and R&B artists (Juno, Maple Blues Award, Western Canadian Music Award and/or Quebec Lys Blues Award winners and nominees). The Cove venue is friendly and intimate located in a beautiful 140 year old country inn in one of the most scenic villages in eastern Ontario – Westport – located on the shores of Upper Rideau Lake on the historic Rideau Waterway (a UNESCO World Heritage Site) – only a 1.5 hour drive from Ottawa, 45 minutes from Kingston, 2.5 hours from Syracuse, 3 hours from Toronto and Montreal. There are 9 shows this season including one 2 Night Stand – Jack de Keyzer in January. All shows take place from 7-11 pm. The ticket price remains the same for the fifth year in a row – $65 (plus HST). That includes a delicious full course buffet dinner, dancing, door prizes and a chance to win 2 Grand Prizes at the end of the season. Proceeds from each show go to support different local charities. To date $68K has been raised for the Westport community and the goal is to raise at least another $5K this season. Note: Bands may change due to unforeseen circumstances so best to check the website or contact The Cove Inn as each show date approaches. Well-priced accommodation is available at The Cove and nearby B&B’s and a motel but book well ahead. All the beds in Westport usually sell out on BOTR nights.